Cary, NC – The Mayton Inn has made a name for itself in the nearly two years it has been open, as both a boutique hotel and through its restaurant The Verandah. That restaurant is going through a change now as Regan Stachler takes over as executive chef. The Mayton Inn opened in early 2016, with chef Jeff Gompers preparing the dishes at The Verandah at the time. Gompers moved on in the past month and Stachler is transitioning into the role. 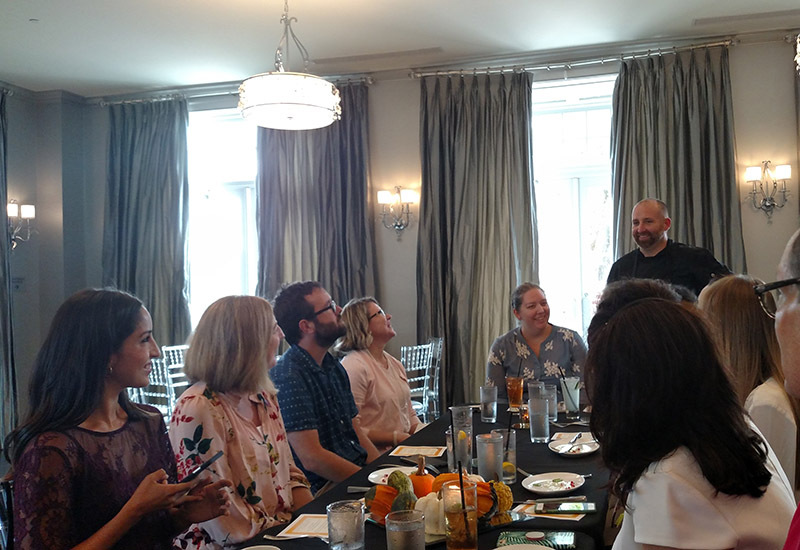 The current Fall menu represents a midpoint between the old and the new, with the Winter menu promising to fully reflect Stachler’s vision and ideas with original items. Stachler was previously the chef and owner of Little Hen in Apex, which was known for a focus on “farm to table” cooking that is also embraced at the Mayton Inn. Stachler also runs the pop-up dinner “Chickenwire” and will continue to do so even in his current role at Verandah. Part of the goal of The Verandah, according to owners Deanna and Colin Crossman, is to offer meals that fit the luxury interior without making customers feel like they need a jacket and tie to be able to dine with them. Part of Stachler’s idea for the restaurant is to bring in more dining elements that fit that interior, namely cart service. Similarly, Stachler wants to try adding flambé desserts to the menu as he tries to capture the feel of The Verandah. “With food, we’ve done it all. Now it’s time to bring it back and improve on how it used to be,” Stachler said. CaryCitizen was lucky enough to get a chance to try the Fall menu laid out by Stachler. 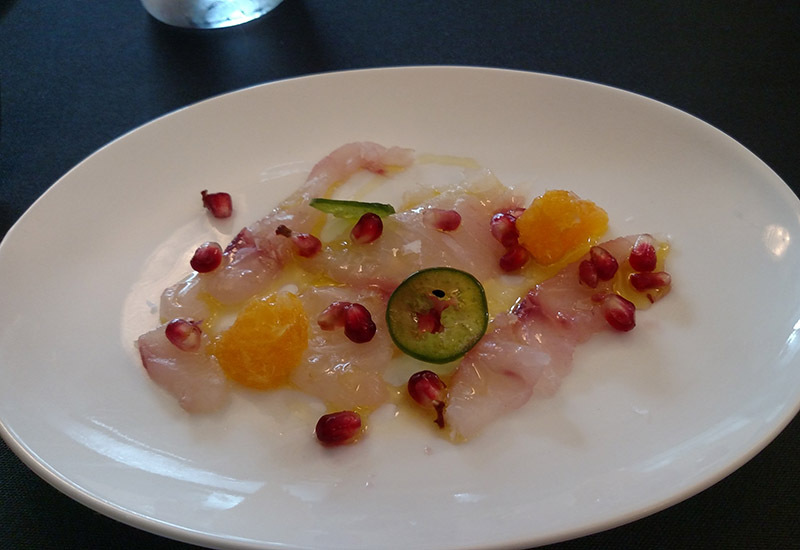 The first course was a snapper crudo, with shrimp topped with pomegranates, orange, jalapeño as well as olive oil and crunchy salt. It had a light flavor and the crunchy salt helped cut down on the chewiness or softness you would typically find in shrimp and give it more body. Also, the tangy fruits paired well with the spicy jalapeño and both complimented one another rather than canceling each other out. 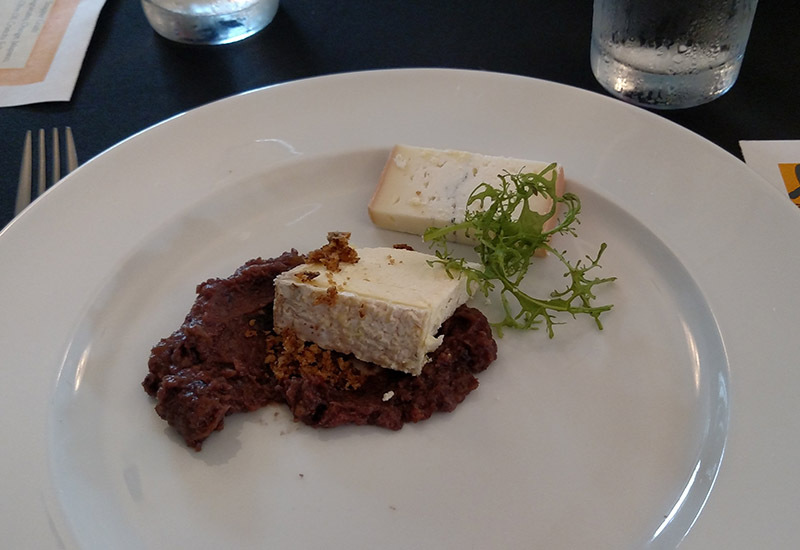 After this appetizer came a cheese dish, with cheese from Prodigal Farm in Rougemont, North Carolina, paired with a tapenade on the side made from dates and olives with some walnut mixed in. Stachler said Prodigal Farm has world-class cheese and it fit that moniker, with a strong and heavy flavor. The tapenade was fine on its own but it was best when eaten with the cheese, giving the mild sweetness a new dimension thanks to the sour cheese. 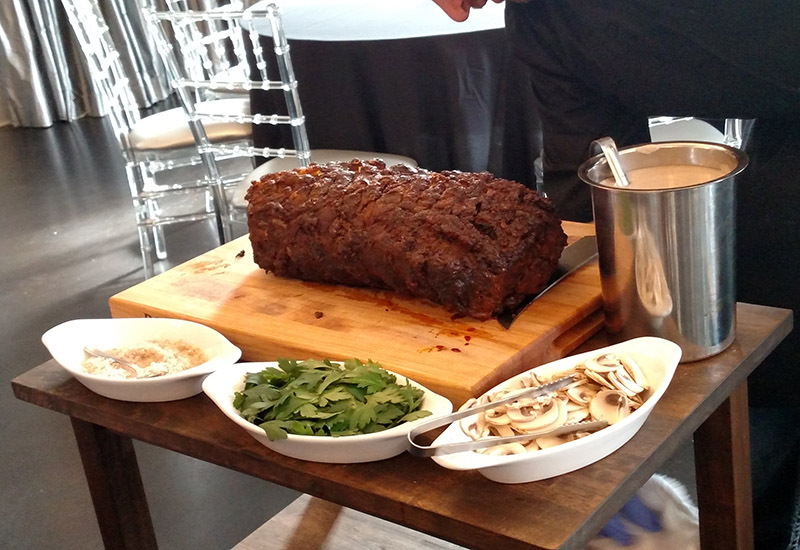 The main course of the lunch let Stachler demonstrate what he meant with his cart service idea as he rolled up a smoked prime rib. The plates came with grilled eggplant and crispy fingerling potatoes. From the cart, Stachler added braised vegetables and dished out a mushroom soubise sauce. 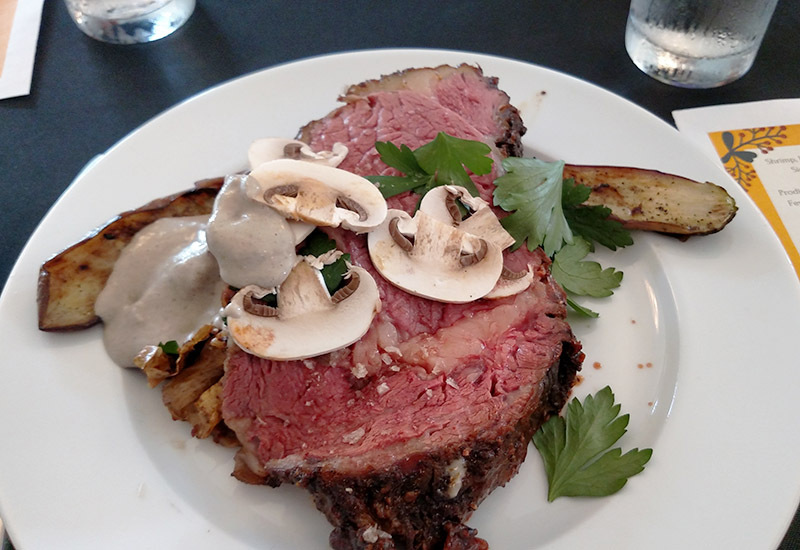 The smoke from the meat could be smelled from the other end of the table and you got even more of that smokey flavor from the cut-up mushrooms and the fat in the prime rib. It was a lot to eat but it was very tender and easy to get through, plus it had very big flavors that encouraged eating more. Then at the end, the potatoes and eggplant made for a good cool down. Finally came the dessert, which seemed to be one of Stachler’s more creative dishes. Both Deanna and Colin Crossman don’t eat dairy so Stachler created a panna cotta that is essentially a deconstructed key lime pie, but with coconut instead of dairy. 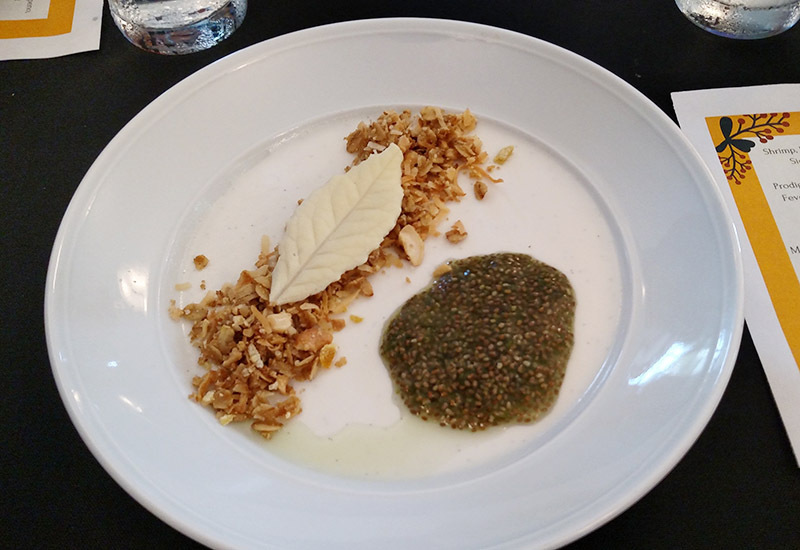 On top of the panna cotta were lime chia seeds, a cashew granola and a leaf of white chocolate that tasted like there was some mint in there as well. It was a light dessert and had a sweet taste without too much coconut overpowering it. The lime was appropriately sour and the granola gave it some texture to differentiate each bite. 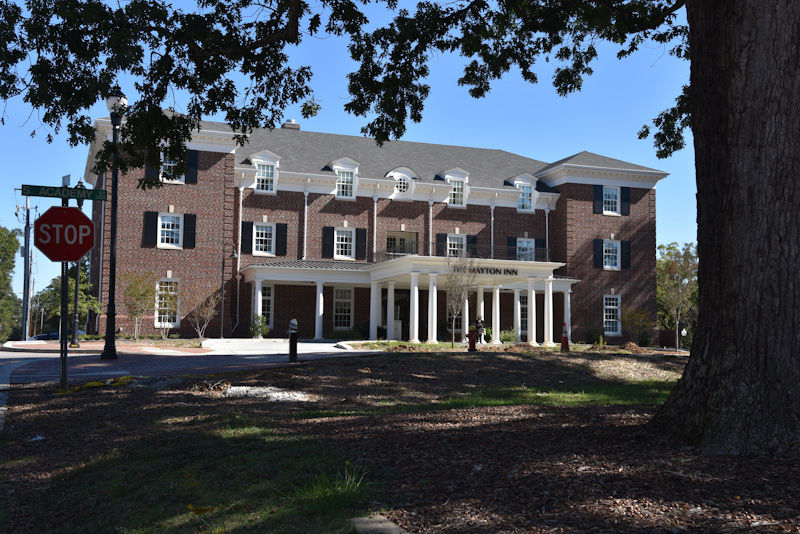 The Mayton Inn and The Verandah are located at 301 S Academy St. in Downtown Cary.